eBay fraud is big news. It does happen, of course it does, but it’s nowhere close to the sensational levels that warrant a front page expose in the Sunday Times. You can read the article here. I certainly don’t think shill bidding is ‘widespread’. In fact, in my experience with eBay, shill bidding is not only taken very seriously as a policy infraction but the company has become much more sophisticated over the years in detecting it. Moreover, it doesn’t pay. If you shill bid and you win (as sometimes you surely will), you still have to pay the fees. It’s annoying that an article such as this can be published without right of reply by business sellers, who rely on eBay for a living. Whipping up unbalanced fear does affect consumer confidence, it tarnishes the reputation of everyone who trades there. I’m certainly going to write to complain about this article and strongly suggest that other eBay sellers do too. Quite simply coverage such as this is bad for my selling and shouldn’t be allowed to stand. Oh, and another thing. To the journalists and sub editors of the Sunday Times. The past participle of ‘bid’ is also ‘bid’. It’s not ‘bidded’. 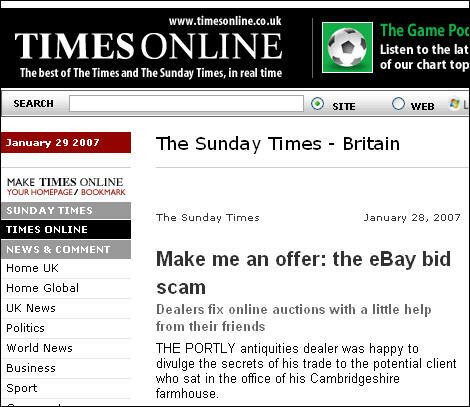 I’m writing about “Revealed: How eBay Sellers Fix Auctions” (28/01/2006). It stated that shill bidding is a widespread business practice on eBay. I have been an eBay seller since 1999, I have sold hundreds of items on eBay, am a former eBay employee, have written a book called Make Money on eBay UK and met thousands of eBay sellers over the years and not only have I have never shill bid, I have never met a serious seller who thinks it’s a legitimate business practice. To claim that shill bidding is “widespread” and to tar the majority of sellers with the same brush is offensive and damaging. 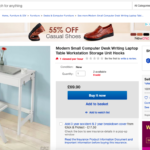 To an honest person building a business, who doesn’t shill bid, I found the article biased, failing to give a balanced picture of eBay businesses. Perhaps the Sunday Times will redress the balance with a positive piece about law-abiding sellers offering superb service and providing customer satisfaction? This would be a much easier task than pursuing a few dodgy dealers. I must also add, perhaps impishly, that it is difficult to take an article seriously where the journalists (who perhaps sensibly didn’t state their name) and editors don’t know that the past tense of ‘bid’ is actually ‘bid’ not ‘bidded’. Reach for the dictionary before aspiring for the first page splash: perform your trade flawlessly before damaging the livlihood of others. In the first instance DO NOT CONTACT eBay as they are particularly keen to hide such activities from the public in an attempt to reassure members that itâ€™s safe on eBay and will hide behind the data protection act if asked for detail needed in order to take action yourself. DO REMEMBER TO SAVE OR PRINT the pages relating to any wrong doing before eBay removed them and changed the data in order to claim that you were not in fact the winning bidder as happened in my case and donâ€™t be put off perusing eBay when they suddenly start replying to you complaints in a foreign language such as Flemish. You can be sure eBay collected it fees from the person who conned me and have access to IP Addresses and bank details to stop these people opening a new account so from a commercial perspective they are on the side of the criminals however help is at hand with site such as http://www.Ebusters.co.uk, http://www.GoofBay.com when help monitor and catch these criminals. If your not convince that eBay are involved in such illegal activities then see http://www.theregister.co.uk/2005/02/24/ebay_shill_lawsuit/ that will maybe change your mind. One last little tip is to save your time from complaining on eBay forums as you will soon discover such unfriendly topics are weighted to quickly disappear off the bottom of the screen and donâ€™t believe all them cars that went unsold with no reserve at Â£0.99 with no bids as itâ€™s a clear manipulation of the data by eBay as I have witnessed this myself. eBay is knowingly â€œaiding and abettingâ€ fraudsters! Do you think there is a problem with fraud on eBay? Do you think that eBay is doing anything to protect you from such fraud? Do you think that only sellers have problems with eBay? Well, actually, in what will undoubtedly be a counterproductive attempt to improve their â€œbottom lineâ€, greedy eBay is now knowingly â€œaiding and abettingâ€ shill-bidding fraudsters to prey on everyone buying on eBay. Shill bidding is huge on eBay in the UK and after a lot of study i would estimate that 20-35% of cars being listed have sills on them. Are we realy to beleive eBay has so many new buyers all with yellow stars ? I Think not and thats why the members are leaving ebay and ebays profits have just dropped 29%.